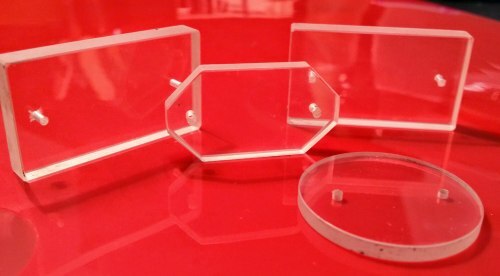 Alkor Technologies manufactures KCl optical elements: KCl windows, Drilled KCl windows, KCl wedges according to customer's specifications. The largest dimensions of KCl optics: Diameter 120 mm x 30 mm Thk. Please send us your specifications and we will quote it within 24hrs. Potassium Chloride is used for infrared windows, lenses and prisms when transmission in the range 0.3-20µm is desired (transmission extends beyond that of Sodium Chloride). Potassium Chloride is soluble in water and polished surfaces of KCl windows must be protected from moisture. KCl windows can be used at temperatures up to 400°C.